If Oprah was a mother, this pillow would be one of her Favorite Things! When it comes to nursing pillows, this is probably one of the best nursing pillows out there. And I just love the design. I was so excited when I opened my front door and saw a giant box sitting on my from porch with my Mombo Pillow inside! One for me and one for a lucky lady out there! Meet my little guy; my baby number three. Oh, I just love those cheeks! I have never used any sort of pillow to support me while I nurse, so as you can imagine, this mombo nursing pillow was a dream come true! In fact, ever since I became a mother, my shoulder has been giving me trouble. After using this pillow to nurse my little guy, I realized that maybe the lack of support I was giving myself during feedings could have been a huge factor in my shoulder pain. Using the pillow literally took so much weight off. I loved how he was positioned higher and we could have more body contact instead of his legs dangling down as he sits awkwardly on my lap. I felt like I could cradle my baby and this made feeding him even more special. The thing that I love about this pillow is that it has a firm side for nursing, which provides excellent support, and a soft, plush side for lounging. 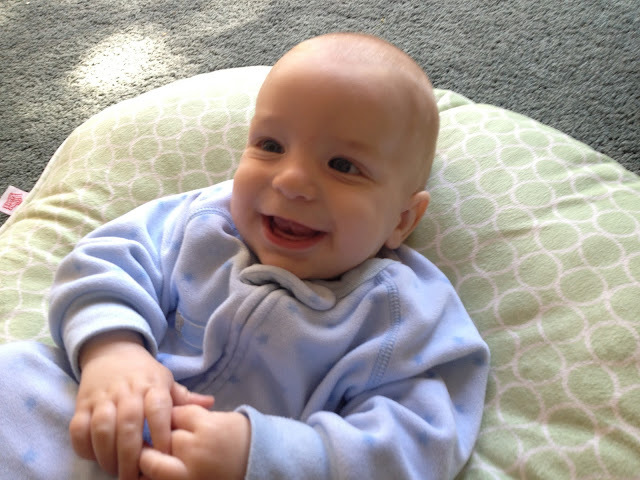 My little guy loved it when I propped him up on the pillow especially because it has the option to have vibration which was completely and utterly soothing. Sometimes I just need to set him down while I get things done around the house or take care of my other kids. My arms have needed a break and this pillow has kept him so happy while he lounges on the floor. 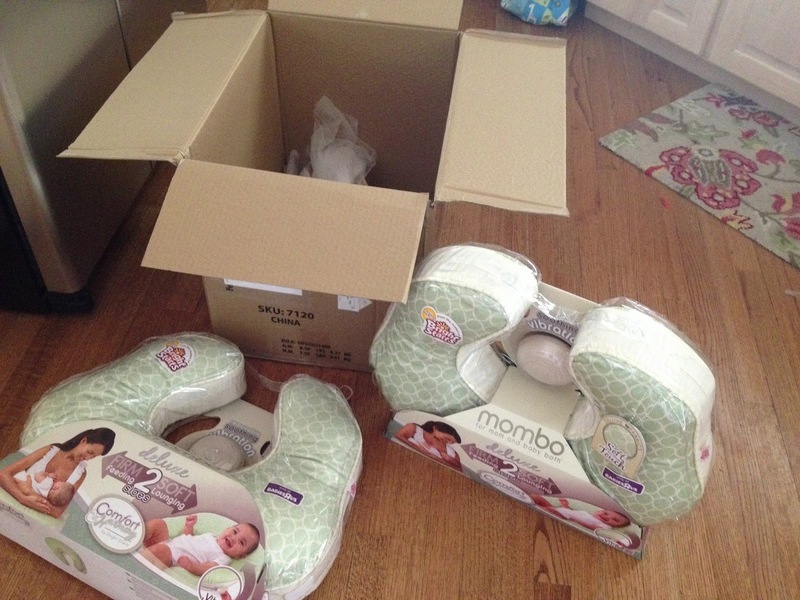 Be sure and check out other mombo nursing pillow products found at Toys R Us. You can choose from many different, cute patterns and designs. You may also want to follow Comfort & Harmony on Facebook and on Twitter to stay informed about all sorts of mommy news, from delicious smoothie recipes and baby health tips, to cute baby crafts and other cool infant accessories. So who will win this dream come true mombo nursing pillow?? All you have to do to enter the giveaway is leave a comment below telling us why you want this pillow so badly. Good luck to EVERYONE! One of my dearest friends is having her second child (a girl this time. Yay!) any moment now and I would love to surprise her with this. Thanks! Oh my goodness, It would make it so much easier for me to feed my son! My wrists often have a hard time supporting him so it would make life just a little bit sweeter. I love him and I'm sure he'd love feeding time even more! I would love to give this to my sister who is expecting her first baby as a gift!! I have 3 kids and nursed everyone one of them and I know how important it is to have great support where and when you need it! Plus she is finishing up nursing school and with a new baby almost here I'm sure she'll benefit from being able to lay him down on it while she studies. 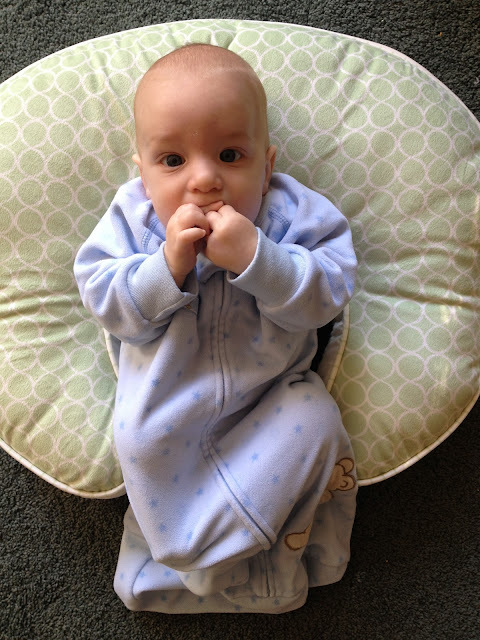 My son is two months old and I would love a mombo pillow! I have a used boppy pillow that isn't quite cutting it for me. Love your website! I just refinished a high chair! The Mombo Pillow is all yours! Please email me within 24 hours at diydivas2@gmail.com to claim your prize! Thank you for entering and have a wonderful day! I'm sorry Desi, but it has been over 24 hours since I announced you as the winner. I have to give the pillow to another follower. Thank you for entering and I hope all is well! My son has Cerebral Palsy and these pillows are great for supporting him in different positions. Lora, you are the winner! Email us at diydivas2@gmail.com and give us your address so we can send this amazing pillow your way. Congrats! I'm so sorry Lora, but it has been 48 hours since I announced you as the winner of the Mombo Pillow and I am going to have to announce a new winner. Thank you for entering and I hope all is well! I'm having my third baby in October and I need a nursing pillow update. The one I have is 6 years old. I really like the fact that the Mombo has the firm side for nursing. I would love one!! I've never used a nursing pillow before but I've heard they are amazing. It would be fun to try it out with this new little one about to come! I don't just want, I need this pillow! I am on my third boy, who is 5 weeks and realized that the blankets and couch pillows I shove under my arms are just not cutting it. And with 3 boys under 5 and one income, I am scraping together a living right now and would LOVE LOVE LOVE this! i want this pillow for my sister in law! she needs it bad! Those look awesome. My little one could definitely use it! I would love to give this to my daughter-in-law who is expecting our first grandchild, soon. She has made my son very happy! I need this for my brother! They are waiting the arrival of their first baby! We are so excited! My sister is pregnant and due in July, and this would be an awesome gift for her! I want this pillow to give to my son and daughter-in-law who are trying now to have a baby. My daughter has two little girls and she used this for both of them, and continues to rave about it. What a great gift! And this one has the vibration; my daughter's pillow did not. Yay! Thanks for the chance! 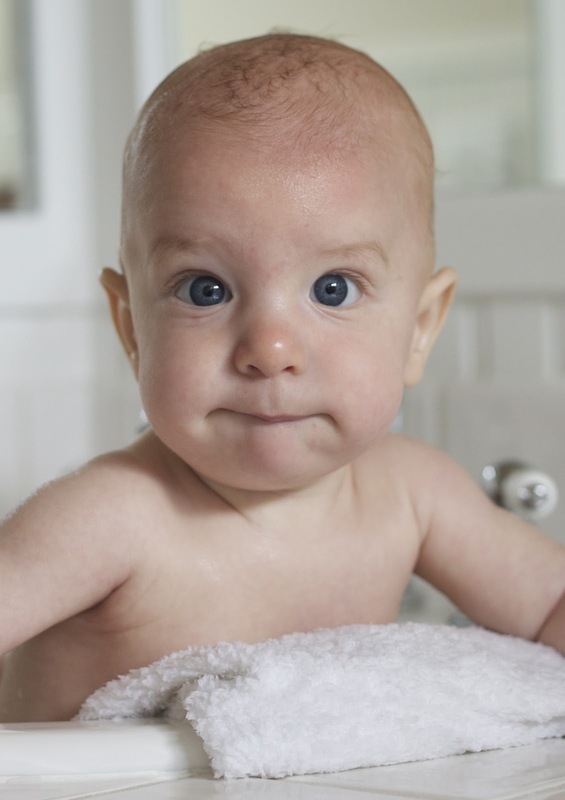 I just had my 1st babe and would love to try this pillow out! I am pregnant with number four and my original boppy has bit the dust... plus this sounds about a million times better than that! Plus, isn't it fair that poor baby number four gets one thing that isn't a hand me down? :) Pick me! I have a My Brest Friend that seems to be disintegrating and is now only an inch or two thick. I need a new pillow that actually works! My husband and I are trying for our first baby and would love to have this for him or her! I am expecting my second and I am so excited to try nursing again ( it didn't work out so well with my first, think pain and screaming from both parties). I would be more than happy to get this amazing pillow that I have heard so much about! It would be so great to give this to my sister! She is 18 weeks and just found out their insurance does not cover maternity. We will all chip in to help, but something like this will truly brighten her day! Otherwise, I'm following that link and getting one for her :) Thanks for the info!! I hope I'm not too late to enter this! I want to win one because I recently found out I'm expecting baby #2 and I really could use a nursing pillow! i would love one of these my old one didn't make it to number two lol im expecting in august and would love to try one of these out it looks a lexus compaired to my old one! I'd be thrilled to have this for myself and my first baby, a boy, due to arrive in August! Giveaway ends on June 13th! Good luck! I am also nursing my third baby. It seems like the hoppy is not supporting her enough now that she is over one year. I would love to use the Mombo!! I would love to win for my sister who is expecting a baby boy in July. I would love to win a Mombo! I tried using a Boppy with my first and a little with my second (just turned 5 mo old) but they don't have enough height or support for nursing. I love how versatile the Mombo seems and the improvements they have made on the basic nursing pillows. It seems like their company did their research with Mom's!!! I moved into my parents house following a nasty divorce. Because of the move, I had to get rid of all my stuff, including all things baby. I'm getting remarried soon and we're planning on having a baby right away. It's a bit stressful because we're starting from scratch on not just housing stuff, but baby stuff as well. This would be so helpful! Thanks for the chance to win! I'm pregnant with my first and am sure I would love this when our little one arrives! Such a fun giveaway! I found you guys searching DIY recliner recover and I have enjoyed looking around. I am expecting a precious baby girl in July and I would love to win a mombo! I am a DIYer but it's fun to just get something new that comes with no work..ya know!! This is my 3rd baby and I've never had a pillow I liked- and I've tried several. I have always had back problems, but they are much worse when I am nursing. I just can't seem to find a pillow that can support either of us well enough to take the stress off my back. This pillow looks so nice & much more firm- I would love to try this pillow! I'd love to win this pillow because it's so versatile! It's great for feeding, tummy time, propping up my little one, etc. Also, so many mom's have told me what an essential item this is!